EDIT: THANK YOU SO MUCH FOR THE DAILY DEVIATION! Not only does your OC have amazing style, but the work in the background is awe. 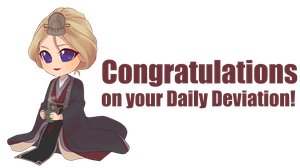 Congratulations on your DD !! I like your assured graphic style, bold and delicate at the same time. Nice! Reminds me a bit of a young Hannibal Lecter. ow, I have a crush on the colors and profile of this charming character. you have conquered a Frenchwoman! He reminds me of Dimitri from Anastasia. Ah, I hadn't thought of Dimitri but yes indeed. Makes me think of Thomas in Pocahontas or Lanfeust de Troy. (I'm completely in love with this type of guy). He reminds me of Stefano Valentini from Evil within 2! Very cool!